Queen Isabel of Castile [d. 1504], castle of Toro, Zamora province. Diego Flores, by 13 March 1505, possibly as agent for Margaret of Austria. Margaret of Austria, Regent of the Netherlands [d. 1530], Mechelen. Jules Quesnet, Paris, by 1904. Private collection, Zurich, from c. 1941; (Feilchenfeldt, Zurich, by 1964); purchased 1965 by NGA. Francisco Javier Sánchez Cantón, "El retablo de la reina Católica," Archivo Español de Arte y Arqueología 6 (1930): 97-103. Inventories of 1516 and 1524. André Joseph Ghislain le Glay, Correspondence de Maximilien Ier et de Marguérite d'Autriche..., 2 vols., Paris, 1839: 2:481-482. See Exposition des primitifs français, exh. cat., Paris, Musée du Louvre and Bibliothèque Nationale, 1904: no. 111. Letter of 31 October 1960 from Mrs. Walter Feilchenfeldt, in NGA curatorial files. Exposition des primitifs français, Musée du Louvre and Bibliothèque Nationale, Paris, 1904, no. 111, as a follower of the Master of Moulins. In Memoriam, Ailsa Mellon Bruce, National Gallery of Art, Washington, D.C., 1969, unnumbered checklist. Circa 1492: Art in the Age of Exploration, National Gallery of Art, Washington, 1991-1992, no. 42, repro. Hispania-Austria: Die Katholischen Könige - Maximilian I und di Anfange der Casa de Austria in Spanien, Schloss Ambras, Innsbruck (part of the Kunsthistorisches Museum, Vienna), July-September 1992, no. 53a, repro. Reyes Y Mecenas: Los Reyes Católicos - Maximiliano I y los Inicios de la Casa de Austria en España, Museo de Santa Cruz, Toledo, Spain, March-May 1992, no. 208, repro. The panel consists of a single piece of wood with a vertical grain. The painted surface comes to the edge of the panel at the bottom, but there are unpainted margins on the other three sides. A thin band estimated to be lead white runs along the left and top edges of the painted surface. A nick in the panel at the top edge slightly to the right of center has been filled. The x-radiograph shows a very dense layer, probably containing lead white, applied over all with diagonal parallel strokes. Its purpose is unclear. Contrary to Jazeps Trizna's statement, the painting is in very good condition. There are some small areas of loss and inpainting in the Virgin's blue robe, at the edge of the paint surface, and along the vertical crackle pattern. The back of the panel is bare wood and is inscribed FR at upper right and Marie Stre 12 juin... in the center, along with other illegible notations. Bouchot, Henri. L'Exposition des primitifs français. Paris, 1904: not paginated, pl. 81. Durrieu, Paul. "L'exposition des primitifs français." Revue de l'art ancien et moderne 16 (1904): 419. Fry, Roger. "The Exhibition of French Primitives." The Burlington Magazine5 (1904): 369-370, repro. 371. Lafenestre, Georges. "L'exposition des primitifs français." Gazette des Beaux-Arts 32 (1904): 127. Winkler, Friedrich. "Juan de Flandes" and "Zittoz, Miguel." In Thieme-Becker. 37 vols. Leipzig, 1907-1950: 19(1926):278-279, 36(1947):531-533. Friedländer, Max J. "Neues über den Meister Michiel und Juan de Flandes." Der Cicerone 21 (1929): 249-254, 115-118, 132, pl. 25. Sánchez Cantón, Francisco Javier. "El retablo de la Reina Católica." Archivo Español de Arte y Arqueologia 6 (1930): 101-105, 132, pl. 25. Isherwood, Kay H. "Two Paintings by Juan de Flandes." The Burlington Magazine 58 (1931): 197-201. Sánchez, Cantón, Francisco Javier. "El retablo de la Reina Católica (Addenda et corrigenda)." Archivo Español de Arte y Arqueologia 7 (1931): 150. Winkler, Friedrich. "Master Michiel." Art in America 19 (1931): 247-248, 252, fig. 2. Winkler, Friedrich. "Neue Werke des Meisters Michiel." Pantheon 7 (1931): 175-178. H[ulin] de L[oo], [Georges]. In Trésor de l'art flamand du moyen âge au XVIIIme siècle. Mémorial de l'exposition de l'art flamand ancien à Anvers 1930. 2 vols. Paris, 1932: 1:50. Post, Chandler Rathfon. A History of Spanish Painting. 14 vols. Cambridge, Mass., 1930-1966: 4:35, 38, 470. Baldass, Ludwig. "The Portraiture of Master Michiel." The Burlington Magazine for Connoisseurs 67, no. 389 (August 1935): 77, 78, 81. Richardson, E. P. "Three Paintings by Master Michiel." The Art Quarterly 2 (1939): 103. Johansen, Paul. "Meister Michel Sittow, Hofmaler der Königin Isabella von Kastilien und Bürger von Reval." Jahrbuch der königlich Preussischen Kunstsammlungen (Jahrbuch der Berliner Museen) 61 (1940): 2, 16-17, 35, fig. 8. Winkler, Friedrich. "Neuentdeckte Altniederländer III: Michel Sittow." Pantheon 31 (1943): 98. Weinberger, Martin. "Notes on Maître Michiel." The Burlington Magazine 90 (1948): 251. Sánchez Cantón, Francisco Javier. Libros, tapices y cuadros que coleccionó Isabel la Católica. Madrid, 1950: 188. MacLaren, Neil. National Gallery Catalogues. The Spanish School. London, 1952: 22, 24-25 (2d ed. rev. by Allan Braham, 1970: 42-43, 45-46). Michel, Edouard. Musée National du Louvre. Catalogue raisonné des peintures du moyen âge, de la renaissance et des temps modernes. Peintures flamands du XVe et du XVIe siècle. Paris, 1953: 182. Lépicier, Augustin-Marie. L'Immaculée Conception dans l'Art et l'Iconographie. Spa, 1956: 76, pl. 4. Gaya Nuño, Juan Anotonio. La pintura española fuera de España; historia y catàlogo. Madrid, 1958: 305, no. 2662. Margareta van Oostenrijk en haar hof. Exh. cat. Mechelen, 1958: 10, under no. 86. Brans, Jan V. L. Vlaamse Schilders in dienst der Koningen van Spanje. Louvain, 1959: 44, 189. Goldblatt, Maurice H. Deux grands maîtres français, le Maître de Moulins identifés, Jean Perréal. Paris, 1961: 42, fig. 18. Bermejo, Elisa. Juan de Flandes. Madrid, 1962: 11. Puyvelde, Leo van. La peinture flamande au siècle de Bosch et Breughel. Paris, 1962: 355, 455-456. Folie, Jacqueline. "Les oeuvres authentifiées des primitifs flamands." Bulletin de l'Institut royal du Patrimoine artistique 6 (1963): 245-246, fig. 36. Eisler, Colin T. "The Sittow Assumption." Art News 64 (September, 1965): 34-37, 52-54, fig. 1. Summary Catalogue of European Paintings and Sculpture. National Gallery of Art, Washington, 1965: 123. Cairns, Huntington, and John Walker, eds. A Pageant of Painting from the National Gallery of Art. 2 vols. New York, 1966: 1:94-95, color repro. "Chronique des arts." Gazette des Beaux-Arts 67 (1966): 46, no. 179, repro. Gudlaugsson, S. J. "Sittow (Zittoz)." In Kindlers Malerei Lexicon. 6 vols. Zurich, 1968: 5:363. Schiller, Gertrud. Ikonographie der christlichen Kunst. 6 vols. Gütersloh, 1966-1990: 4, pt. 2:151, 257, 423 fig. 743. Christie, Manson & Woods. Christie's Review of the Year, October 1966 - July 1967. London, 1967: 25. Reynaud, Nicole. "Le Couronnement de la Vierge de Michel Sittow." RLouvre 17 (1967): 345-351, fig. 3. European Paintings and Sculpture: Illustrations (Companion to the Summary Catalogue, 1965). Washington, 1968: 110, no. 1928, repro. Koch, Robert A. Joachim Patinir. Princeton, 1968: 30. Cooke, Hereward Lester. The National Gallery of Art in Washington. Munich and Ahrbeck/Hanover, 1970: 66-67, color fig. 30. Davies, Martin. Primitifs flamands. Corpus. The National Gallery London. 3 vols. Brussels, 1970: 3:9, 11. Walker, John. Self-Portrait with Donors: Confessions of an Art Collector. Boston and Toronto, 1974: 42-44. European Paintings: An Illustrated Summary Catalogue. National Gallery of Art, Washington, 1975: 330, repro. 331. Lurie, Ann Tzeutschler. "The Birth and Naming of St. John the Baptist Attributed to Juan de Flandes. A Newly Discovered Panel from a Hypothetical Altarpiece." Bulletin of the Cleveland Museum of Art 63 (1976): 119, 129, 132, 133, fig. 26. Trizna, Jazeps. Primitifs flamands. Contributions. Michel Sittow, peintre revalais de l'école brugeoise (1468-1525/26). Brussels, 1976: VIII, 25-28, 73, 91-92, pls. 1-3. Campbell, Lorne. Review of Michel Sittow ... by Jazeps Trizna. In Apollo 105 (1977): 225. Bruyn, Josua. Review of Michel Sittowpeintre revalais de l'école brugeoise 1468-1525/26 by Jazeps Trizna. In Oud Holland 92 no. 3 (1978): 212-213. Demus, Klaus, Friderike Klauner, and Karl Schütz. Kunsthistorisches Museum. Flämische Malerei von Jan van Eyck bis Pieter Bruegel der Ä. Vienna, 1981: 176. Kauffmann, C. M. Victoria and Albert Museum. Catalogue of the Paintings in the Wellington Museum. London, 1982: 78. Bauman, Guy C. "Juan de Flandes." In The Jack and Belle Linsky Collection in the Metropolitan Museum of Art. New York, 1984: 62; 63 nt.2 under no. 20. European Paintings: An Illustrated Catalogue. National Gallery of Art, Washington, 1985: 377, repro. Haverkamp-Begemann, Egbert. "Paintings by Michiel Sittow Reconsidered." In Rubens and his World. Bijdragen opgedragen aan Prof. Dr. Ir R.-A. d'Hulst. Antwerp, 1985: 8. Hand, John Oliver and Martha Wolff. Early Netherlandish Painting. The Collections of the National Gallery of Art Systematic Catalogue. Washington, 1986: 236-240, color repro. 237. Brown, Jonathan. The Golden Age of Painting in Spain. New Haven, 1998: 10, fig. 2. Circa 1492: Art in the Age of Exploration. Exh. cat. National Gallery of Art, Washington, 1991: no. 42, color repro. 162. 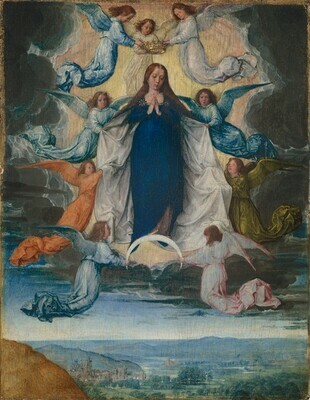 Stratton, Suzanne L. The Immaculate Conception in Spanish Art. Cambridge, UK: 52-53, fig. 33. Brown, Jonathan. Painting in Spain, 1500-1700. New Haven, 1998: 19, fig. 23. Mittler, Gene A., and Rosalind Ragans. Exploring Art. New York, 1999: 80-81, fig. 5.2. Eichenberger, Dagmar. "The Habsburgs and the Cultural Heritage of Burgundy." In Borchert, Till-Holger. The Age of Van Eyck: The Mediterranean World and Early Netherlandish Painting 1430-1530. Exh. cat. Groeningemuseum, Bruges, 2002. London, 2002: 192-193, fig. 213. Hand, John Oliver. National Gallery of Art: Master Paintings from the Collection. Washington and New York, 2004: 56-57, no. 39, color repro. Snyder, James. Northern Renaissance Art: Painting, Sculpture, the Graphic Arts from 1350 to 1575. Revised by Larry Silver and Henry Luttikhuizen. Upper Saddle River, 2005: 213, col. fig. 10.27. Nash, Susie. Northern Renaissance Art. Oxford History of Art series. Oxford, 2008: 236, 237, fig. 165. Frinta, Mojmír S. "Observation on Michel Sittow." Artibus et historiae 30, no. 60 (2009): 140-141, 144, color fig. 1, 1a. Weniger, Matthias. Sittow, Morros, Juan de Flandes: Drei Maler aus dem Norden am Hof Isabellas der Katholischen. Kiel, 2011: 55, 74-77, no. 4, fig. 17, 37.